Spinning in colour… | carpe diem! Or What I Learned Today. So Far. I honestly think that ‘the day I stop learning is the day I die’ is one of several good rules to live by. Playing with fibre makes that an easy rule to follow. This is me yesterday, courtesy of A, who was vastly amused by the way I’d spread fibre all over my ‘real’ work-in-progress. tried to capture the opulence. Doesn’t work, does it? but the end result was not good. I really like the silk, though I knew that already. I love the way it catches the light. And I love the interplay of the subtle colours in everything. I’m going to ‘finish’ that (tiny) skein properly, then knit it. 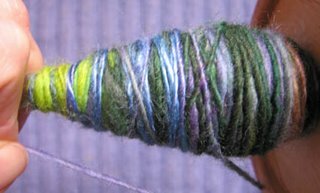 I’ve been thinking about the way that knitting affects the colours of a yarn. In a knitted garment each strand of colour is crossed by other strands, breaking that colour into flecks, specks, dots. The end result is, or can be similar to a pointillist painting;* if you can, take a look at some of the sock pictures in the Twisted Sisters workbook. Perhaps that will break up the Lime candy-cane a bit, although I suspect this yarn is too thick. Sweater News Headline: Self-Discipline May Prove Key To Success! Sub-head: Calculator and glass of red wine prove essential. I re-read the textbooks and returned to the mirror armed with a stern sense of purpose as well as a measuring tape. My shoulder-warmer sweater-to-be currently has raglan seams measuring c. 6″ in length. Me and my tape measure reckon that I need seams about 9.5″ to the underarm (given the wider-than-usual neck). So I have 3.5″-worth of raglan increases with which to attain my desired width of back and front at the underarm, which is 21″ or about 95 stitches. The back is currently 74st, so I want about 21 more (call it 20), which is 10 right-side rows or 20 rows all told. I’m getting 7 rows/inch… 3.5″ is about 24 rows total, 12 right-side rows, which is 24 stitches added at the seams. So if I continue the raglan increases as I am doing, the back will be 98 stitches (74 existing stitches + 24 stitches) wide. Which is nearly 22″, which added to a front of 22″ gives me a sweater 44″ at the bust instead of my planned 42″. I think. If so, that’s bad news. I must slow my rate of increase so that I have, lessee, 20 increases instead of 24. * And someone’s put up a page where you can play with the technique! Isn’t the internet wonderful? This entry was posted in Uncategorized on November 5, 2006 by sarahw. I’d be curious to see the yarn you made knit up. it may pleasantly surprise you in the distribution of the lime.I get a head ache reading your sweater calculations. I use the sweater wizard software. it figures it all out.I command you courage! The yarn is currrently dripping over the sink; when it dries I’ll knit and show. As for the calculations: they’re more intimidating to read than to do. The most difficult bit (for me) is forcing myself to think this through properly — I want to knit, not think. Even if the sweater doesn’t fit in the end or I don’t like it, I’m learning a lot about how I can make garments fit me. I just have to think things through before I start. I’ve seen mention of Sweater Wizard; I will investigate it (it should run under Virtual PC). 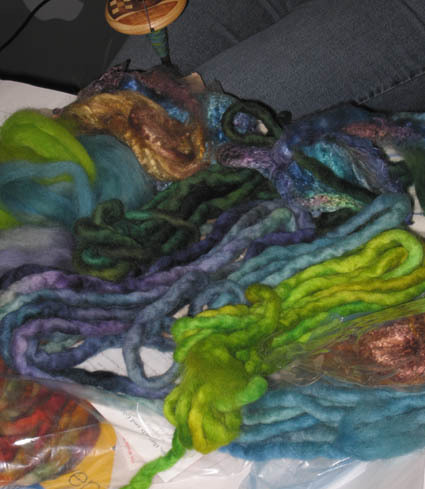 I think the handspun will be great knit up. The one thing I’ve learned from spinning and dyeing is that all color is great. It is amazing what a lime or yellow (previously despised colors in my mind) can do to really rock the world of a plain jane bunch of subdued colors. However, if you like the silk subdued shades, ditch the lime and spin on. You’ll make gorgeous stuff. Also remember, this isn’t a masterpiece…you’ll spin more! You’re learning. 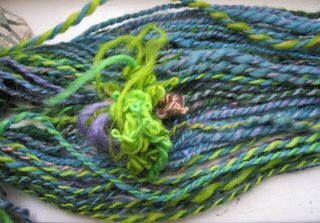 Nothing has to be perfect!The rest of “your Joanne handspun yarn” that matches up went off today to the gallery. 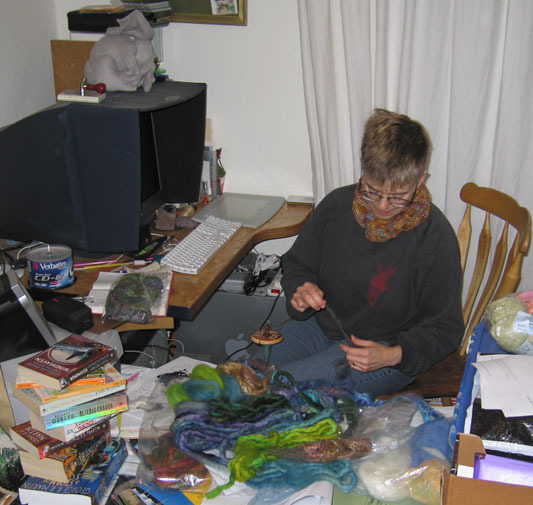 Someone else in the world will knit it up… Oh, and the sweater math? I don’t love sweater wizard. It’s ok, but I think you’re managing complicated raglan math just fine. I find that program has very staid sweater shapes and the amount of ease is too large for me. It’s making my head hurt just reading your math though, and I design sweaters! I’ve not fiddled with stitches and measurements like that before, but I admire your courage and ability to keep with it! I don’t mind some complicated projects, but mostly I like to sit down and knit so I can think about other things. If I have to do knitting math late in the day, trouble will come, LOL.